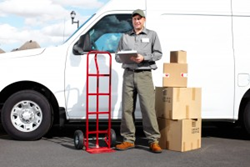 24/7 Van Lines will be offering more cross country moving and storage options in order to better ensure the safety of inventory being transported for clients. In addition to current standards, inventory will be digitally photographed and scanned by new technology which enables that inventory to be more easily and quickly replaced in the event of damage. 24/7 Van Lines is currently updating their cross country moving and storage procedures due to new technology becoming available. After the purchase of 3D printing devices that are to be used throughout the company, it was realized that items could be photographed and scanned so that they could be more easily identified and replaced. The company acknowledges that only less than 2% of inventory is ever damaged in transit, but assures investors that there are other uses to the new technological features being provided. When items are digitally photographed, they are automatically entered into an online registry that scans and identifies the object. This technology is similar in concept to being able to scan or photograph any 3D object in order to 3D print it later. The company is adding the option in order to immediately replace any goods damaged during transport. In addition, the digitally photographed registry coupled with the scanning and identifying process will allow the company to keep better track of exactly which kinds of inventory are transported most often. This will allow the company to cater its services directly to clients which require them the most. Additional cross country moving and storage options are expected when this technology is released to company employees, who are already being trained to operate under the new procedures. A company spokesperson commented on what else to expect. "We'll be making several subtle changes to the company's policies and procedures over the coming months, and all of these are expected to facilitate faster and more efficient business dealings with current and future clients. We anticipate that customers will appreciate the care with which their inventory is handled, and reaction to the new online registry of photographed items has mostly been positive." 24/7 Van Lines has assured clients that this registry only goes online in the event of an accident. Otherwise, it will be stored on company servers until services are discontinued by the client in question. Data is secured by several layers of firewall protection, and those defensive measures have never been breached.